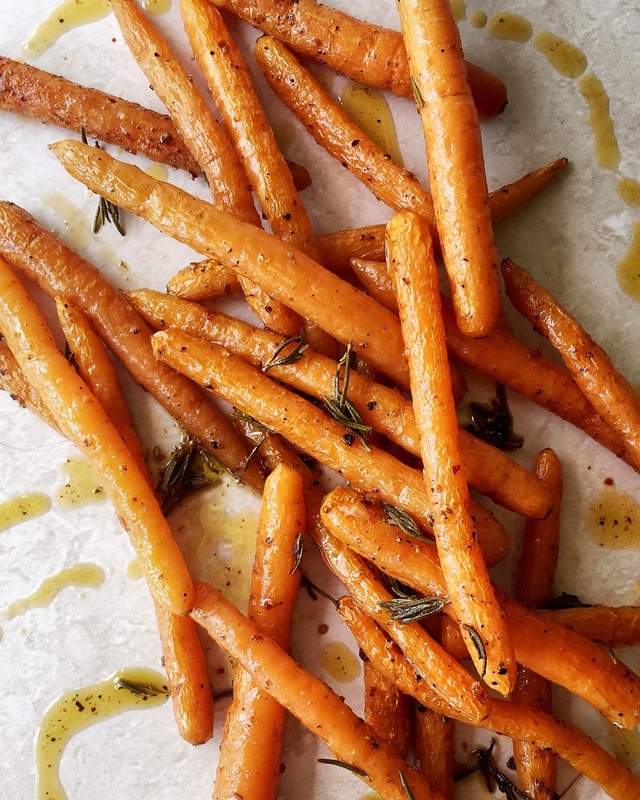 Roasted carrots are versatile and delicious and an easy hassle free side dish to any dinner. They get glossy and sweet and are delicious when they still have some bite to them. They’re also ever so accommodating as far as flavours are concerned. Thyme, garlic and oregano or honey, ginger and orange. All work beautifully together you can really make a marriage between your carrots and whatever main course you are serving. Start off by washing your carrots. There is no need to peel baby carrots. If you have a veggie brush you can use that to give them a bit of a scrub. Dry them off and place in a roasting pan or on a baking tray. Sprinkle and drizzle them with the salt, spices, rosemary and olive oil. Toss them well making sure all the carrots are well coated.Drizzle with honey to slightly sweeten the carrots and make them sticky and glossy. Place them in the oven and roast for 15 minutes. Pull them out, toss and turn them and pop them back in for another 10 minutes. Serve with anything from grilled rib-eye steak to orange & ginger glazed salmon. These look lovely! I’m planning out my Thanksgiving menu (first time that I’m hosting, so nervous), and I wanted to find a carrot recipe that didn’t involve sugar or orange juice – this looks perfect. Thank you for sharing. Pleasure! I agree. Not every vegetable needs to be coated in sugar! Good luck for Thanksgiving dinner. Sure it will be great!